Digitally remastered by David Luke (1987, Fantasy Studios, Berkeley, California). Digitally remastered by JVC using XRCD (Extended Resolution Compact Disc) technology. Digitally remastered using 20-bit K2 Super Coding System technology. This is a hybrid Super Audio CD playable on both regular and Super Audio players. 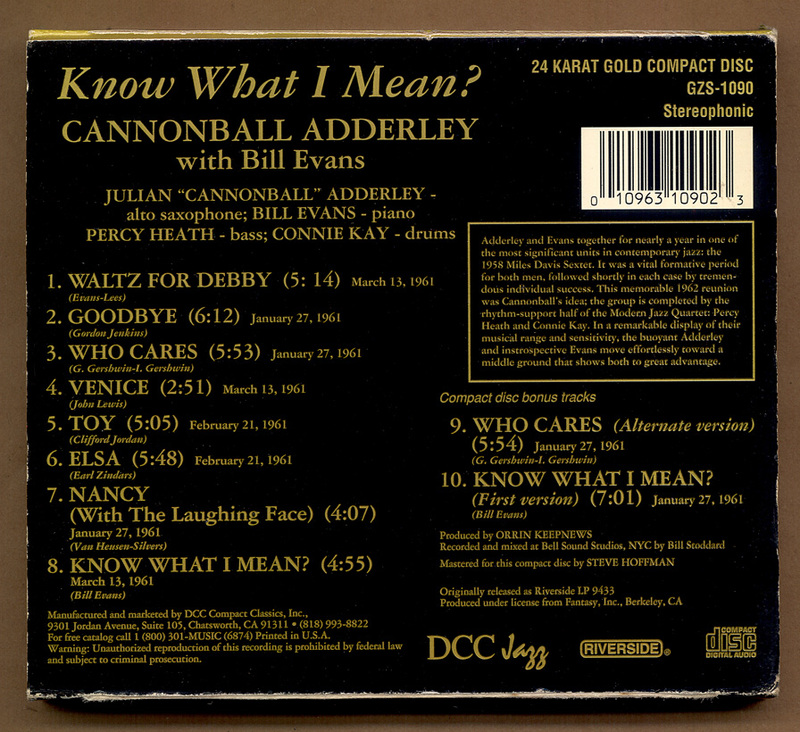 Possibly the best of Julian «Cannonball» Adderley’s many releases, 1961’s KNOW WHAT I MEAN? finds the alto saxophonist in a different setting. Usually found fronting hard-bop combos featuring his brother Nat on cornet, Adderley is here accompanied by pianist Bill Evans, bassist Percy Heath, and Modern Jazz Quartet drummer Connie Kay. In these more placid surroundings, Adderley showcases an entirely different side to his playing. Accompanied by Evans’ impressionistic, watery piano and Kay’s low-key drums, Adderley’s lines are lighter and more peaceful than his usual bluesy tone. The opening «Waltz for Debby» and the moody «Who Cares» could pass for outtakes from Miles Davis’ KIND OF BLUE, a record on which both Adderley and Evans had played. KNOW WHAT I MEAN? is something of an anomaly for Adderley, but it’s a delightful one. This is an under-appreciated masterwork of modern jazz. The CD includes two alternate takes. Recorded at Bell Sound Studios, New York, New York on January 27, February 21 and March 13, 1961. Originally released on Riverside (9433). Includes liner notes by Joe Goldberg and Orrin Keepnews. Personnel: Cannonball Adderley (alto saxophone); Bill Evans (piano); Connie Kay (drums). Liner Note Authors: Orrin Keepnews; Steve Hoffman; Joe Goldberg. Recording information: Bell Sound Studios, New York, NY (01/27/1961-03/13/1961). Unknown Contributor Roles: Connie Kay; Percy Heath; Cannonball Adderley. Personnel: Cannonball Adderley (alto saxophone); Bill Evans (piano); Percy Heath (bass); Connie Kay (drums). Depending on the nature of the person involved, success either dictates more and more compulsive activity, or else it permits relaxation. With Cannonball Adderley, the latter certainly appears to be the case; and this album can, among other things, serve as a testimonial to the truth of this impression. Adderley is undeniably a successful, widely-acclaimed artist, and it may seem to some that his success came quickly. But it is more in the nature of what one night-club comic once referred to bitterly as «my overnight success after fifteen years.» To recap briefly, Cannonball came up to New York in the mid-‘5Os with a thorough background as a player and teacher in Florida, and soon found himself lauded, recorded, and a working bandleader. Being an altoist. he also found himself burdened with the tag «the new Bird» jazz writers being second only to sportswriters in attaching to players designations that might not do them any good). Subsequently and, he now feels, inevitably) his band foundered; thereafter he joined Miles Davis, and people really began to sit up and take notice. He left Miles to re-form his own group, which of course did establish Adderley as a full-fledged success. And that brings us to the present. For, once established, Cannon has remained that way, and has continued to pick up poll awards and capacity crowds almost as regularly as Willie Mays picks off long fly balls. In a peculiar way, the present album is a result of that success. For it is something that Adderley might well not have dared attempt in the past, and that he might not have been able to convince a record company to do. It happens that I find this his most satisfying LP, but that is a purely subjective evaluation and might not even be acceptable as proof that musicians should be allowed to make the kind of records they really want to. The nature of this album should be immediately apparent from Adderley’s choice of associates. Cannonball feels, and many agree, that pianist Bill Evans is unexcelled when moody delicacy is called for; Miles Davis, who once had both men in his band, agreed to such an extent that his repertoire changed appreciably during Evans’ tenure. And the presence of Evans need not limit moods or tempos, for as Cannonball is well aware, the pianist tends to display more pulsing strength behind a horn than with his own trio. The union exposes unexpected facets of all four men, but primarily it reveals a different and possibly unfamiliar side of Julian Adderley.It would be unkind to affix a new label to him after he has finally rid himself of That old Parker-linked one, but it is difficult to resist calling him «the new Benny Carter»: there is a basically Carter-esque approach to ballads, but one that is fully cognizant of all that has taken place since Carter first made his great reputation. It sings, it is light, it is airy – and it is still very much Cannonball. Then, of course, there is the material. Two pieces, chosen by Evans, are selections he is especially familiar with and fond of playing. One is his own Waltz for Debby, which first appeared some years ago in a brief solo version on Bill’s initial Riverside album, «New Jazz Conceptions,» and most recently re-appeared as the title tune of an LP recorded by his trio at the Village Vanguard. Here it undergoes further alteration with the addition of Cannonball’s summery horn. The other piece, Elsa, by Evans’ friend Earl Zindars, is surely one of the most pensively lovely of all jazz waltzes. It was also previously recorded by Bill (in the album «Explorations») and here, by the absence of one note, Evans shows how his feeling about the number has now changed. Clifford Jordan’s Toy is a by-product of Adderley’s sometime capacity as an A&R man, having appeared on an album by Jordan that he produced for Riverside. Cannon plays it with one astonishing nod in the direction of Ornette Coleman, as well as a brief reference to John Lewis’ Golden Striker. The latter was part of the score for the film «No Sun in Venice,» which also included Venice, a number that is atypical of Lewis in that it is very close to the popular song form. Adderley plays it here with an unusual and affecting soto voce dancing quality. Possibly the poignant sadness of Gordon Jenkins’ Goodbye (originally Benny Goodman’s sign-off theme) has led most jazzmen to shy away from it, but that same quality serves quite well in an album such as this one, where emotion is clearly not something to be feared. Jazz versions of Nancy (for a long time almost the exclusive property of Frank Sinatra) are similarly rare, but its pensiveness is perfectly suited to the talents of Adderley and Evans, as they eloquently demonstrate. Who Cares? is the most overt rocker of the set, and on Evans’ solo evokes a startling reminiscence of the light, dancing quality that was one of the chief delights of the Miles Davis band in its Garland-Chambers-Philly Joe period. Know What I Mean? 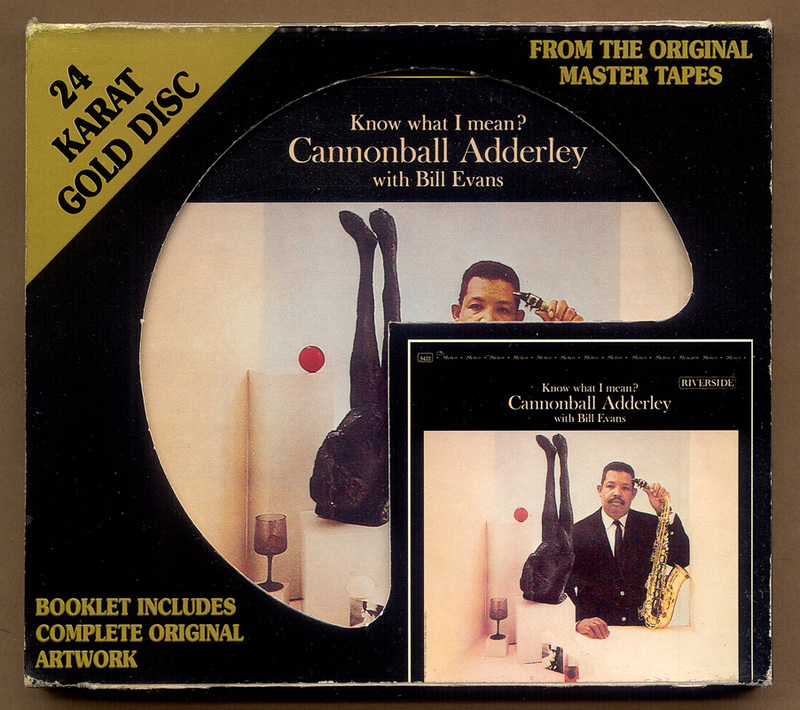 was created in the recording studio by Evans, at Adderley’s special request Its modal style suggests the days when he and Bill were with Miles, and its title derives from a phrase Cannon is fond of using. The question is one for which you should have an affirmative answer long before reaching its closing spot on the LP. Not all of these selections are ballads, by any means, but the whole album is filled with the aura of relaxation we began by mentioning. Ordinarily, this would get to be referred to rather tritely as an «after-hours» mood, but in this instance it can be recognized as simply a matter of four highly skilled artists away from their usual tasks and delighting in one another’s musical company. Nothing more really need be said about the results of their meeting than that the feeling of delight come: through.